[miau] One of the coolest things about popular comic books is that fans will always get to see their favorite heroes show up on the big screen, on video games, and even in online video slot machines. Such is the case with one of Marvel’s most unique superheros, Blade. The half-vampire, half-human blood-thirsty crusader made big waves on the big screen after a successful comic book series, and now Playtech has developed and released a top-shelf video slot machine of the same name, Blade. But does the slot machine live up to the franchise? It’s very hard to play Blade and not instantly notice the cool theme. Blade looks more like the comic book version than the movie version. So if you were expecting to see Wesley Snipes in this video slot machine, you may be disappointed. However, fans of the comics should appreciate the true-to-the-story details the company implemented in creating this game. Everything you find in the comics you can also find in the slot machine, as Blade sets out to go on a vampire killing spree. The graphics are good, the sounds and cut scenes are entertaining, and like all Playtech machines, the cash can pile up. Some of the symbols include Blade himself, 10-A playing card symbols, a wide array of Blade’s kiling tools, bad guys, and more. 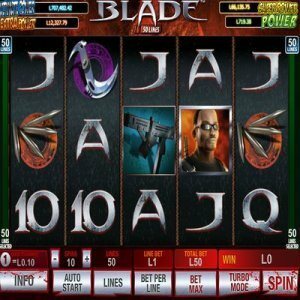 While there is no standalone bonus game offered on this 5-reel, 20-payline slot machine, Blade does offer a pretty cool feature in the Blade Split. When this happens, the end symbol on a winning payline will be split into two. So, for instance, if you hit four silver bullets, you will actually be paid for five after the Blade Split happens. That, along with some free spins, and you might just forget that there is no real bonus game. Blade does give players a lot of betting options. Whether you want to play for a penny or two, or a few bucks, you can easily adjust your bet amount. You can also choose how many lines to bet on, or take advantage of the quick Bet Max feature for optimum leverage. Or if you’d rather sit back and just watch the reels spin, you can choose the auto-start feature and just let the game go by itself. The Blade Slot machine offers a break from the customary temples and gambling-themed and candy machines out there. Not that there’s anything wrong with them, of course; some players would just rather have a unique experience while playing slots. This is where Blade can make all the difference. It’s a non-progressive machine that doesn’t have a real bonus game, but there are plenty of ways to win big with Blade, plus the theme is very cool and unique.